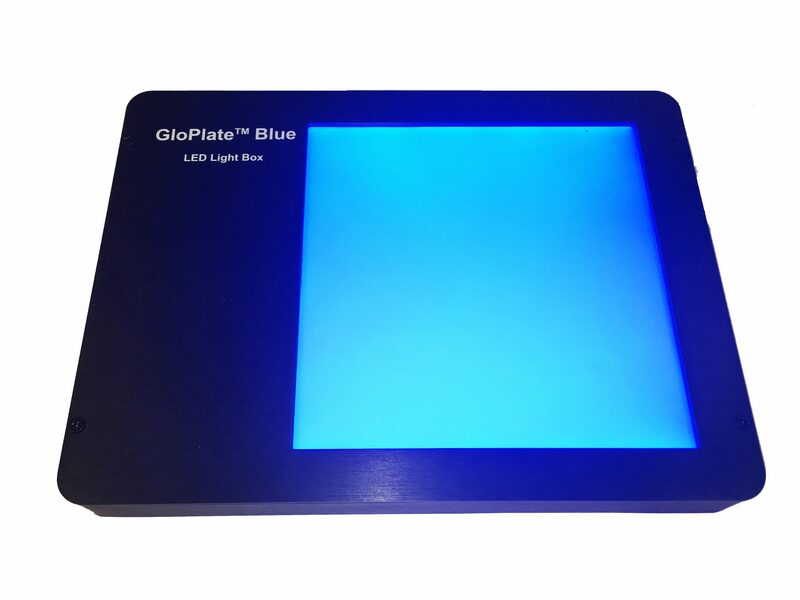 The Glo-Plate™ Blue LED Illuminator is a light-weight, multi-functional LED light box. The LEDs in the Glo-Plate™ Blue were designed for optimal photolysis of PMAxx™– or PMA-treated samples in viability PCR applications. While our original PMA-Lite™ LED photolysis device was designed for use with microcentrifuge tubes, the Glo-Plate™ Blue device allows for more flexible assay set-ups, including multi-well plates for high-throughput assays. 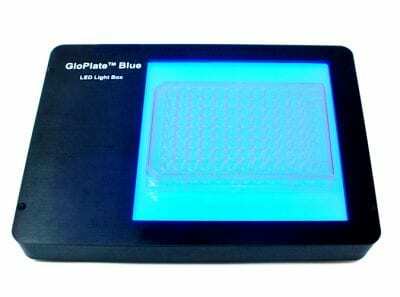 The base of the Glo-Plate™ Blue chamber contains blue LED lights topped with a diffuser, allowing for even illumination across samples. The Glo-Plate™ Blue LED Illuminator is also an excellent light source for developing the staining of gels stained with the visible blue DNA gel stain DNAzure®. DNAzure® is a novel, visible blue DNA gel stain with extremely high sensitivity. After staining with DNAzure® the DNA bands first appear colorless, but then become dark blue after developing with light exposure. The benefit to using DNAzure® instead of fluorescent DNA dyes is that once the stain has developed, the DNA can be visualized by eye, without the need for imaging equipment. This is particularly advantageous for processes such as gel excision.